Having defeated the Wizard of Frobozz in Zork II, you now tumble down an endless stair. A vision of an old man greets you with a challenge to the final test. Your brass lantern can be found at your feet. Zork III: The Dungeon Master (Marc Blank and Dave Lebling; publisher: Infocom; 1982; Z-code 3). Zork III: The Dungeon Master (Marc Blank and Dave Lebling; publisher: Infocom; 1982-84? ; Z-code 3). Zork III is included on both The Lost Treasures of Infocom Volume I and the Classic Text Adventure Masterpieces of Infocom CD-ROMs. 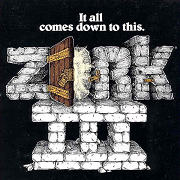 In 2001, the Zork trilogy was briefly available for free download from the Activision website as part of their promotion for Zork: Grand Inquisitor. Activision retains the copyright to Zork III, and any other sites that offer the game for free download are very likely doing so illegally. This page was last modified on 20 October 2014, at 04:26.